…to everyone who joined us at Chadkirk on Saturday. There were over 500 visitors, who all played their part in creating such an enjoyable and successful event. Having returned to Cape Town in 2005 I have just discovered your blog and am so enjoying maintaining my connection with Chadkirk and learning of improvements. Changing the chapel window is a project I am delighted to read about and the bridge is a wonderful idea. It was a long walk from Marple, where I previously lived. I was a Friend of Chadkirk and a member of the initial gardening team, restoring the herb and walled garden. A question: When did the Friends start motivation for and the process of the walled garden restoration? Was it 2000 or later? My regards to those who may remember me. Keep up the great work. Lovely to hear from you, Janice. And interesting to read your comments. There are people from all over the world who visit the blog, and as you say it’s a great way to keep the connections going across the miles and down the years. I have only been involved with the Friends of Chadkirk since 2012. While we haven’t had a chance to meet, some of the people who were in the team when you were an active member of the Friends of Chadkirk continue to spend time in the gardens at Chadkirk, helping the gardens to thrive. Now that your message is on the blog, I hope they’ll be able to get in touch. I’m sure that they will want to send their greeting to a fellow Friend! Pat leads the gardening team. Her enthusiasm and skills are an inspiration. She has been a driving force in the garden and knows the full story of how the transformation of the walled garden was initiated and completed. I wonder if you have read the earlier post about the history of the garden? I have often thought about writing another post filling in some of the gaps. Perhaps your message will inspire me to do that. and for Bobby and his daughter. Chadkirk is a popular place for dog walkers. Today a dog walking family from Marple spotted a notice about the well dressing . 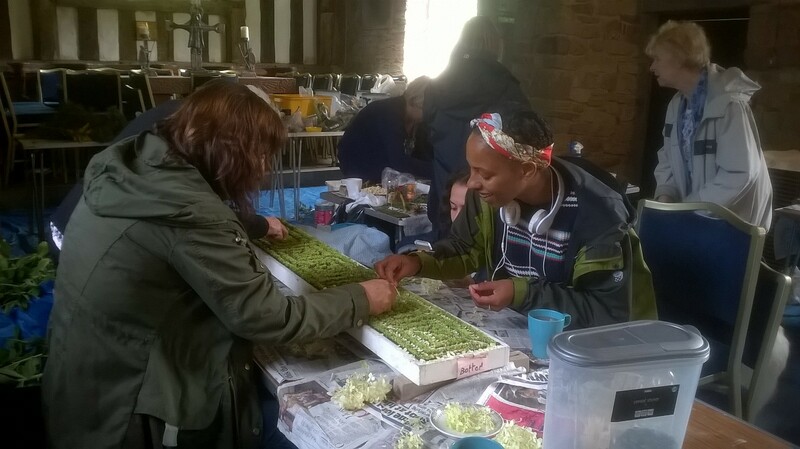 Their curiosity aroused, they dropped in to the Chapel…and stayed for over an hour, providing invaluable support to our team by helping out with the decorations for the dressing of St Chad’s Well for this weekend’s celebrations. This was a lovely family from Marple who dropped by the chapel today because they spotted a notice about the well dressing yesterday while walking their dog. They enjoyed themselves so much that they stayed for over an hour and have put their names down to take part next year. Norah & I were glad of their assistance as we were beginning to wonder if we’d get our panel finished by tomorrow’s deadline. There’s no such problem now! The photos show the team at work and just a glimpse of the design. Interestingly, this year Pat has come up with a design based on a beautiful map of Chadkirk. It will be fascinating to see the finished map and design, the living map of Chadkirk. For those who can visit Chadkirk this weekend, we’d love to receive your comments about the design. If you can’t get along to see St Chad’s Well freshly decorated for our 2017 celebrations, then we’ll post photographs here. So watch this space! This really is a team effort. Planning has been underway since the Friends group learned that the usual Festival could not go ahead this year. While the people from the Friends of Chadkirk Team have enjoyed spending time and energy and applying their expertise to enable the event to happen, it is also delightful when other folk get involved too. I am sure that all those who visit Chadkirk this weekend (and throughout the year) would join with me in saying a big thank you for all that they do. Chadkirk is a special place. The WellDressing Celebration is one event of many and part of their unique contribution to the life of our community. Long may they thrive! If you have visited Chadkirk and have a photo or a comment, please get in touch and we can share comments with other folk who love Chadkirk. Will the well stay dressed for a few days? My daughter really wants to see it but we won’t be able to get there until Saturday evening. Just wanted to let you know that the Chapel is open tomorrow. 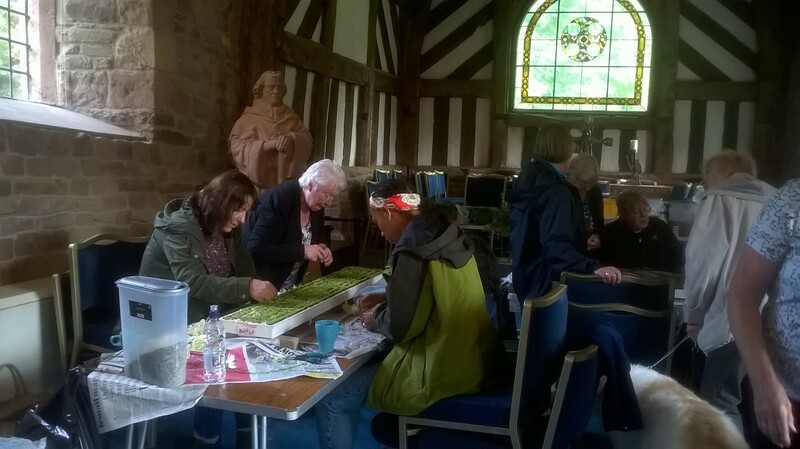 There will be volunteers putting the final touches to the decorations for St Chad’s Well. If you have the chance, your daughter might be interested to go along and see how it’s done. After the unveiling and opening ceremony on Saturday the decorations are left in place for all to enjoy. Being made of flowers and other organic materials, this means that it will continue to look good for a few days. After that it will fade and decay. It may continue to look fine for the following week, but slowly or quickly, depending on the weather, it’s beauty will fade. Hopefully you will be able to get along to Chadkirk on Saturday and see the Well, all dressed up and in it’s prime. In the meantime, we might be able to put some photos of the work being done, so that you can see how the decorations are built up. If your daughter would like to be involved and be a part of the team that makes the dressing, why not let one of the Friends of Chadkirk know? It’s good to have people young and old, families and friends joining together on this local piece of art. Why not join in when you can? Disappointed that there will be no Chadkirk Festival this year? Enjoy the last weekend in July differently. 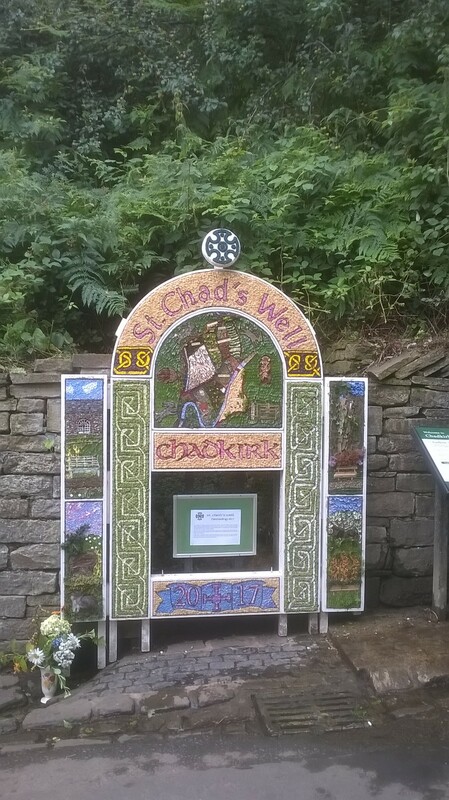 Visit Chadkirk on Saturday 29th July for our Well Dressing Celebration. Delightful space, gentle country walks, nature and historic buildings, friendly people and foody treats. It’s on Saturday 29th July 2017 from 12 noon onwards, presented and organised by the Friends of Chadkirk. The Well Dressing Blessing is at 1pm. Stockport Silver Band will be giving performances at 2pm and 3pm. The ever popular plant stalls will offer healthy plants at bargain prices. Friends of Chadkirk will offer locally produced items for sale,including cards by local artists. A second hand book stall and a Tombola. Something of interest for all ages. For one day only The Organic Food Store sets up it’s stall in Chadkirk Chapel. Other food stalls will be available. Well dressing in previous years… what will this year’s design be? For many years, many people have reserved the last weekend in July for our annual Chadkirk Festival.Then in 2016, the re-opening of Bramhall Hall meant that the Festival couldn’t happen as in previous years. Instead Friend of Chadkirk organised a smaller event while we all hoped for a return to the full festival.However, this year I understand that funding/staffing issues have meant that Stockport MBC is unable to offer the support to enable the kind of Festival we have come to know and love. Nevertheless the Friends of Chadkirk are an adaptable bunch and they have a different kind of day for your delectation! Yes, it’s on a smaller scale, though now there’s free admissions as well as free car parking. It will have some of the hallmarks of the bigger festival: music and stalls, refreshments and games, crafts and treats. As usual, it offers an afternoon in a delightful space, milling and chatting with other fine folk in a friendly setting. Proceeds from the Friends stalls will add to their funds and so help Chadkirk Chapel and Country Park thrive and continue to offer a place for all to enjoy. We look forward to seeing you on Saturday 29th July 1-4pm. The Well Dressing Blessing will take place at 1pm. Delicious and tasty light refreshments will be available. The plant stalls will offer healthy plants at bargain prices. As these sell out fast, keen gardeners get there early. Friends of Chadkirk stalls with items for sale including cards, & 2nd hand books. There will be a chance to have a go on our Tombola. Other stalls of local interest will include The Organic Food Store.